Moishe Shagal was born on July 7, 1887 in Vitebsk, Belorussia (currently Belarus). He studied painting and drawing from an early age attending Jewish schools. In 1907 he moved to St. Petersburg to continue his education under the stage designed Leon Bakst. In 1910 he left Russia for Paris and started to work in avant-garde projects with other important artists and intellectuals of the time. During this time, Chagall achieved great notoriety which allowed him more freedom to work. Between 1914 and 1922 the now famous artist lived in Russia and Soviet Belarus exhibiting his work to great success. He also lived in America and again in France where he produced countless monumental works such as the stained glass windows for the Reims and Metz Cathedral, and part of the ceiling in the Paris Opera. During his life he worked virtually every medium known to artists and adopted several styles from cubism and fauvism to expressionism and surrealism. 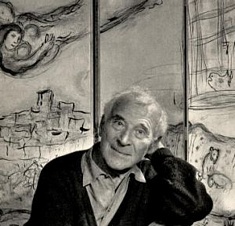 Marc Chagall, an icon of Jewish modernism died in Saint-Paul, France on March 28, 1985 just 3 years short of his 100th birthday.